My Free Ukulele Lesson Book is Finished! I am so excited to write this post. Over the past month, I’ve been working on writing a ukulele lesson book for you all, and I’m finally done! It’s ready for you to download and check out right now. So, you’re probably wondering what’s in it. I’m glad you asked! The cool thing is you don’t have to wait for me to tell you. I’m giving it away for FREE and you can download it right now. Sweet! 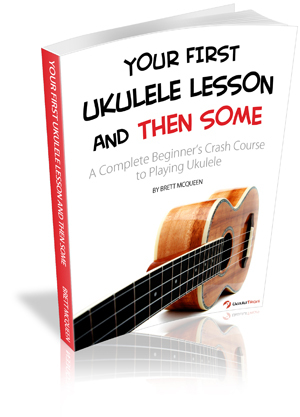 As a whole, I wanted to write a ukulele lesson book that was a complete crash course for a beginner into the world of ukulele. Meaning, anyone just beginning ukulele can use this book to start learning today. In 28 pages, I cover everything from how to hold your ukulele the right way, helpful tips on tuning your ukulele by ear, the most important chords to know, versatile strumming patterns, how to play your favorite songs, and obviously much more. There are a lot of pretty pictures and graphics too. However, this isn’t just intended for a complete beginner. Even if you’ve already started, you can pick up some new tricks. In the first part of the book, I present some very foundational aspects from which to build on, and in the latter parts of the lesson, I show you some ways you can build on these foundations and unlock even more possibilities in your progress as a ukulele player. All to say, you have nothing to lose by downloading it for free. I really hope it’s a helpful resource for you, and if you do find it helpful, please consider passing the word on about it to others (e.g. Twitter, Facebook, etc.). I’d love to hear your feedback and what you think! If you have any questions or any troubles downloading the book, just let me know. Brett, as someone who is just picking up the ukulele I have so appreciated your website and FREE book. You have a wealth of information on here that’s perfectly suited to a beginner/intermediate. Thanks so much all the work you’ve done to put together such a helpful site. Just started to Play and found your book extremely helpful. Thank you. I’m so glad to hear you’ve found the book helpful! That’s awesome. I’m always looking for new songs to post in the future, so I will keep “Don’t Say Aloha When I Go” in mind. Thanks for your comment. You still not send me the ebook although I have submitted the email verification. Hi Reba, my apologies; please try again. We were having some server issues a few days ago related to receiving the free book. Everything should be back up now. HI. Just wondering what booklet shows the progression of a chord down the keyboard?